This entry was inspired by a question posted by a colleague of mine over at Facebook earlier today. My initial answers were: smoked salmon, sushi and pasta. While driving home, I pondered about it and realized that aside from those earlier mentioned, I actually have two more on my list. First is a bucket of Shakey's Mojo Potatoes and second is Cibo's Potato Chips. Cibo is definitely one of my favorite restaurant simply because of its consistency. I love its Farfalle alla Genovese from the time I first tried it, which incidentally happens to also be my first visit to Cibo, and I can't help but order this every single time I dine there. Accurately put, it has been five years of me loving that pasta dish. Another must-order is their Patatine Fritte a.k.a. Potato Chips. It began as a complimentary appetizer which later became a part of their menu. 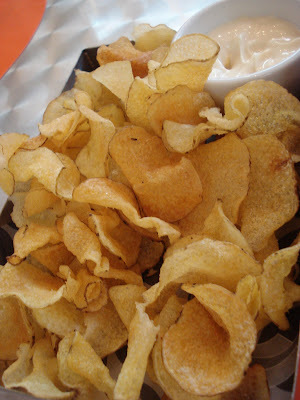 I love the crisp homemade-style potato chips and the yummy aoili dip as well. Yum yum yum! How about you? What's your favorite comfort food? Cibo has a total of 8 outlets in Metro Manila. My favorite branches are the ones in Shangri-la (631-7753), Powerplant Mall (898-0366) and of course, Greenhills Promenade (727-3359). Farfalle alla Genovese the best!